The S.S. Caviar is a ship in Wario: Master of Disguise. Count Cannoli was going to steal this ship's treasures in an episode of his show, The Silver Zephyr, until Wario came, stole Goodstyle, and took all of the treasures of the boat. Galley Cats and Pushy Cats are the ship's employees, and they will attack Wario on sight. Caviar, which the S.S. Caviar gets its name from, is a type of seasoned roe, which are fish eggs. It may also get this name from its cat theme, as cats are often depicted as having an affinity for fish in popular media such as cartoons. Whose Show Is This Anyway?!! After Wario uses the Telmet to enter the TV, he crash lands on Count Cannoli's head, causing him to drop Goodstyle and revert to his normal self. Wario decides to take Goodstyle for himself in spite of Cannoli's objections and, as a result, acquires his first disguise, Thief Wario. Dubbing himself the "Purple Wind", Wario begins to search the ship for treasures to steal. Cannoli tries many times to get his wand back and, after failing, offers to help Wario find treasure in exchange for him returning the wand. Wario agrees. The Purple Wind Stinks Up the Ship! This episode continues right where the previous one left off. 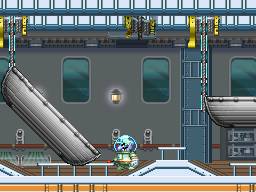 Cannoli informs Wario that he came to the ship to steal an ancient tablet, which is being stored in the cargo bay. Goodstyle reveals that the tablet is a piece of the Wishstone, an artifact that could supposedly grant any wish. Upon learning of this, Cannoli calls the deal off and attempts to find the Wishstone fragment himself. Later, after the end of Wario's adventure, Cannoli returns to the S.S. Caviar to rob it, relieved that Wario isn't there to bother him anymore. However, Wario, bored of real life, returns to the TV and decides to steal the ship's treasures himself. The S.S. Caviar is the only location in Wario: Master of Disguise to be the setting of more than one main story episode, the only one to have two different level layouts associated with it, and the only one with two music tracks. This page was last edited on October 24, 2018, at 18:01.